Traders opposing plans to introduce on-street parking meters held up placards during their unsuccessful attempt to block the move at a council meeting. 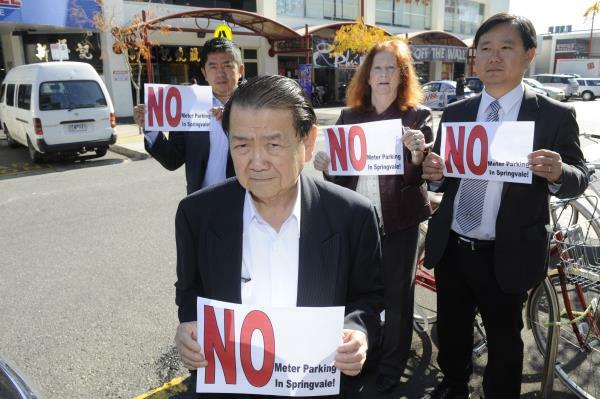 Ten spectators held ’No meter parking in Springvale’ signs as councillor Youhorn Chea launched an unsuccessful rescission motion to scrap the meters. 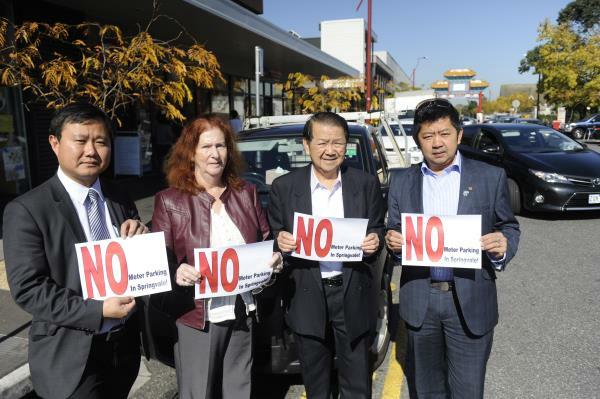 The protest at the Monday 27 April meeting was the latest attempt by Springvale traders in their campaign against Greater Dandenong Council’s scheme. Springvale Asian Business Association (SABA) is sending out 2000 pamphlets to traders, stating its “firm opposition” and urging them to voice their opposition against the “revenue raising measure”. The meters – expected to yield about $900,000 in 2016-17 – were endorsed by councillors on 13 April. After the meeting, SABA spokesman Stan Chang angrily denied the council’s claims that SABA supported the move and that the business group was formally consulted.Mr Chang said the last time he spoke to council officers about their proposal was during a “preliminary” and “confidential” discussion on “dozens of issues” in 2013. “I didn’t give an indication of support. He warned that most traders were against metered parking because they were worried that shoppers would desert them for similar retail strips in Clayton and Glen Waverley. Under questioning at the meeting, city planning director Jody Bosman said he stood by a council report’s assertion that SABA was consulted and would support the meters if revenue was invested in central Springvale. He said last week that a communication strategy to engage with local traders and trader groups would “now be developed“. Cr Roz Blades, who also opposed meters, warned Springvale could be sent “back to the Dark Ages”. “Springvale has meant a lot to a lot of people over the years. “A lot of people came together and changed ‘Heroin City’ to ‘Sensational Springvale’. Mayor Sean O’Reilly last week offered a flexible approach to the council’s stated plans to increase the $1.20-an-hour fees over the next four years in line with Dandenong’s parking rates. In justifying the move, the council said that meters would help drive motorists into the underutilised No.8 car park and decongest street parking which is up to 97 per cent full on Friday and Saturday peak-times. “The meters aren’t there to generate revenue,” Cr O’Reilly said. Cr O’Reilly said it was “true to a small degree” that some shoppers may opt for Clayton and Glen Waverley.